Corinthian: The Corinthian helmet, originated in ancient Greece, developed in the 8th century BC, and took its name from the city-state of Corinth. It is generally accepted as the first Greek Helmet designed, based on archeological evidence. It was made from a single piece of bronze, adapted individually for each warriors. However, because of the large portion of metal covering the face, it severally limited the wearer's critical senses of vision and hearing. So, through the years, it was modified and upgraded to be more effective. 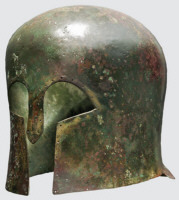 The style gave way to the more open Chalcidian and Thracian helmets that provided more visability and better hearing, and the much simpler Pilos type, which was less detailed and required less bronze, making it cheaper and easier to manually produce in large quantities. Out of combat, soldiers would often wear the helmet tipped upward for comfort. This practice rise to the pseudo-Corinthian / Apulian Corinthian type in Italy, with the characteristic nose guard and eye slits becoming mere decorations on its face, since the helmet was no longer pulled over the face but worn cap-like. The Corinthian helmet was depicted on more sculpture and pottery than any other helmet. Illiryan: This type originated in ancient Greece from the Peloponnese in around 7th century BC. It is so named due to a large number of early finds coming from Illyria. Judging from archaeological evidence, the helmet was an evolution of the Kegel type of the archaic era found in Argos. It was a bronze helmet made by two pieces joined together at the crown. Two ridges running along either side of the seam provided an extra protection. In its later styles, it covered the entire head and neck, and it was open faced in all of its varieties. The Illyrian helmet did not obstruct the wearer's critical senses of vision though the first varieties hampered hearing. Chalcidian: It was especially popular in Greece in the 4th and 5th centuries BC. It was also worn extensively in the Greek (Southern) parts of Italy in the same period. The helmet is so-called because it was first, and is most commonly, depicted on pottery once thought to derive from the Euboean city of Chalcis. In fact, it is no kwon whether the helmet actually originated in Chalcis; indeed, it is no known whether the pottery in question was actualy Chalcidian. The helmet appears to have been a development oh the Corinthian helmet, its improvements in design giving the wearer better hearing and vision, resulting in a lighter and less bulky helmet. 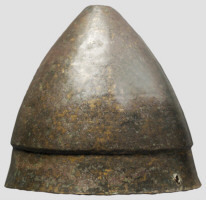 It was made of bronze, and it consisted of a hemispherical dome, and below that, generally inset from the top dome, a pair of cheek pieces and a neck guard, with a substantial loop on either side for the wearer's ears. In the front, between the two cheek pieces, was a small nasal bar to protect the wearer's nose. The helmet could be entirely one piece, or the cheek pieces could be attached separately by hinges, which eased construction and made putting the helmet on easier. The helmet would commonly have a hole pierced on each cheek piece or elsewhere in order to accept an inner lining which was made of leather. Adornments such as combs and other protruberances were usually placed on the top of the helmet. It was often decorated with lines or more complex drawings. The helmet is thought to have developed in turn into the Attic Helmet, a Chalcidian sub-type, which is iconic of classical soldiers. 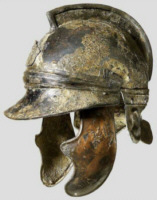 It was similar to the Chalcidian helmet but lacked a nose-guard. 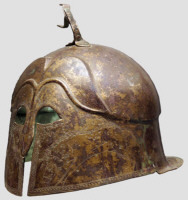 In fact no examples of this type of helmet have been found in Greece let alone in Athens. In Greece the Corinthian and Phrygian types were mostly used. 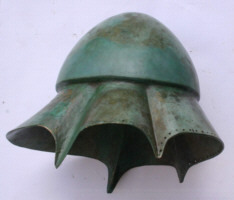 This type of helmet was used by the Greeks in their colonies in Southern Italy, were most examples have been found, and was copied by the people who lived there, including the early Romans; so some of the Roman Republican helmets are based on this type as well as being based on the Beotian helmet. Pilos: The Pilos type helmet was made in the same shape as the felt o leather travelling hat common in Ancient Greece, named Pilos. It was made from bronze and it has a conical shape. It probably originated from Lakonia. The Pilos helmet was extensively adopted by the Spartan army in the 5th century BC and worn by them until the end of the Classical era. It was less expensive and easier to manufacture than other helmet types since it required less bronze and it was less detailed. It did not obstruct the wearer's critical senses of vision and hearing. Phrygian: This type was originated in Classical Greece and was widely used in Thrace, Dacia, Italy and the Hellenistic world until well into the Roman Empire. 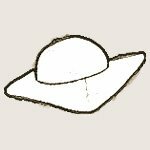 Is received its name due to its resemblance to the Phrygian cap. Thracian: It was developed in the 5th century BC, and was based on a form of cap worn in Thrace, made of a soft material most often rising to a forward pointing peak. It was re-enforced by a band or hem running across the head. The helmet repeated this from in bronze. 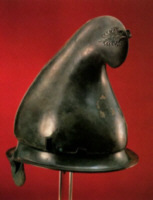 Beotian: The Beotian type helmet was especially favored by the cavalry because of its great visibility. 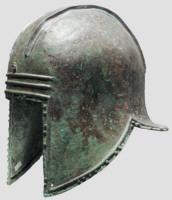 It was a popular helmet, used also by the Romans until the end time of Republic.